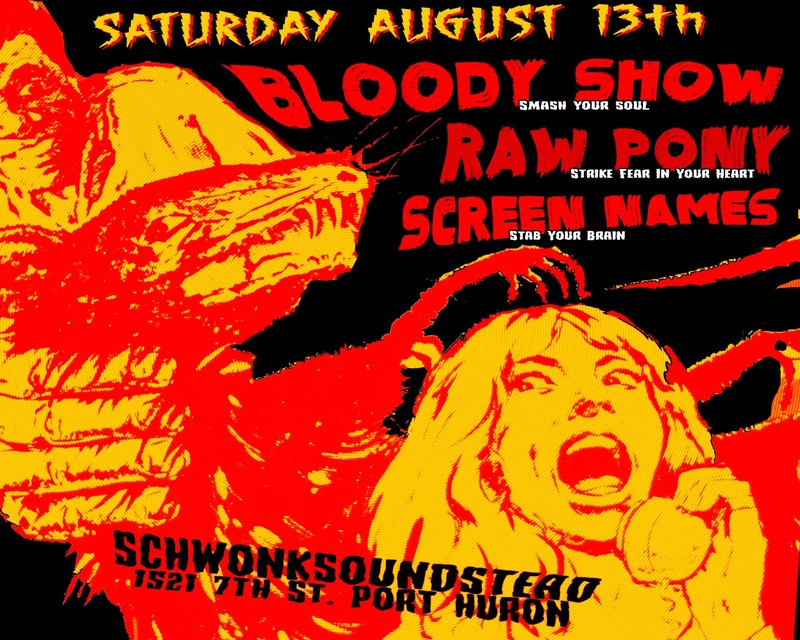 Smashin' Transistors is freakin' pleased to announce an evening of thrills and chills on Saturday, August 13th at Port Huron's SchwonkSoundStead. Heavily bowled over by the hot wired and high energy sounds of Detroit, Ohio's Bloody Show rumble like the MC5 and rattle like Death. Chrome plated rock licks and punk rock patina is all over the sound of this trio and already broke again right after payday belting of bassist Jah Nada really has something to say. Read our take on Bloody Show's EP Root Nerve. To say that Raw Pony sound feral would be an understatement. Feral animals just have claws and teeth to attack with. These Ohio ladies have guitars and volume and sound like they listened to Gories records played on razor wire instead a stylus! Some consider the band's sound garage rock but they're more like a building engulfed in flames. Read our take on Raw Pony's 7inch "Bo Diddley." Though Screen Names are from the local area they sound like they were raised on the corner of Minor Threat and My Bloody Valentine. Hot off the heels of a gig that they'll have played earlier in the day at Brobecue, they'll set the night off with aural M-80's. Though this show is "free" don't be a skinflint. Toss some bucks into the collection plate and buy some of the band's stuff when you get there. Check the events page at ye ol' book of face for the latest developments.